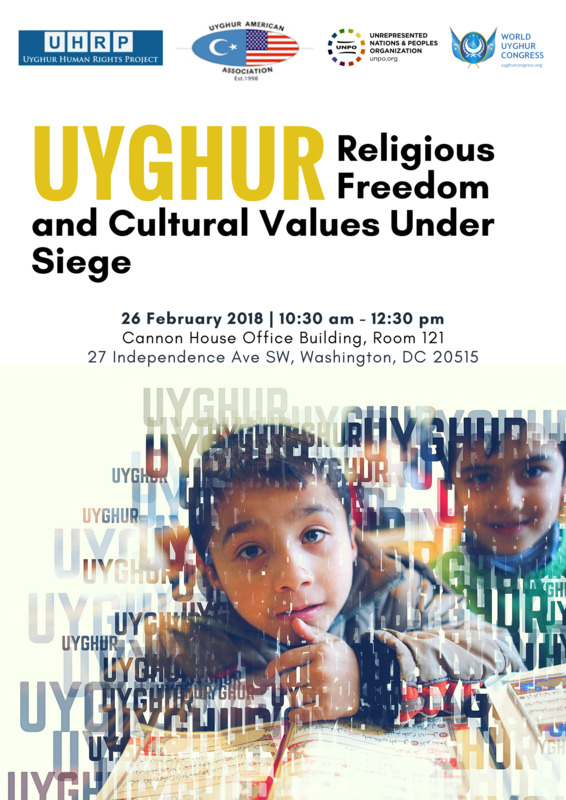 On 26 February 2018, the Unrepresented Nations and Peoples Organization (UNPO), together with the Uyghur Human Rights Project (UHRP), the Uyghur American Association and the World Uyghur Congress (WUC) will organise a conference entitled “Uyghur Religious Freedom and Cultural Values Under Siege”. Taking place at the US Congress, the event will bring together US policymakers, academics, human rights experts and members of the Uyghur diaspora to discuss the current situation on the ground in East Turkestan and what concrete steps must be taken to resolve the issue. High-level panellists will include Sean Roberts (George Washington University), Mr. Teng Biao (University of Politics and Law in Beijing, visiting scholar at New York University), Mr Alim Seytoff (Director of RFA Uyghur Service), Tina L. Mufford (United States Commission on International Religious Freedom), Chen Pokong (Chinese writer, critic and democracy movement activist) and Ms Nicole Morgret (Uyghur Human Rights Project). Religious freedom and cultural values are under siege in East Turkestan, the homeland of the Uyghurs. Advanced technologies are being deployed against the Uyghurs in the name of security, creating what amounts to the world’s most advanced police state, with serious implications for the future of China and the world. Chinese authorities consider religious diversity a threat to the country’s stability and, as a result, implement an autocratic monopoly over freedom of religion. The Uyghurs’ language and culture are also being systematically marginalized and actively suppressed by the Chinese government. Under the pretence of “anti-terrorism", Chinese authorities crackdown ruthlessly on Uyghur communities across East Turkestan, depriving them of their fundamental human rights. Under the pretence of their culture and religious practice being a security threat, a security crackdown has intensified in recent months, with more than 120,000 of Uyghurs being detained in re-education camps, study abroad students being forced to return home for political assessment, with widespread political campaigns and militarization creating a climate of fear. For more information on the conference, contact m.kumetat@unpo.org or nmorgret@uhrp.org.